Wondering if you should focus on Instagram or podcasting, or put more effort into blogging? In our sixth annual social media study, more than 2800 marketers reveal where they focus their social media activities, which social tactics are most effective and how content plays a role into their social media marketing. 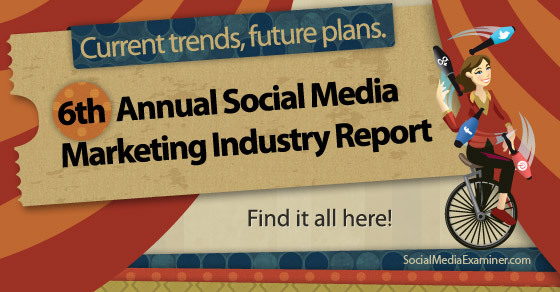 To understand how marketers are using social media, Social Media Examiner commissioned its sixth annual 2014 Social Media Marketing Industry Report. We set out to uncover the “who, what, where, when and why” of social media marketing with this report. A significant 2800+ marketers provided valuable insight you won’t find elsewhere. We examine how B2B social media marketing varies from B2C businesses, how larger businesses vary from smaller businesses and much more. If you’re responsible for marketing your business, you’ll want to closely analyze the pages of this free 50-page report and use it to persuade others. 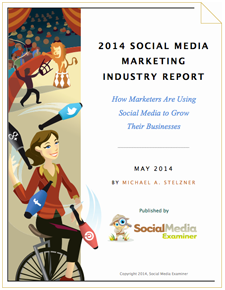 This report is free when you register for Social Media Examiner’s FREE updates. Simply complete the below form and we will send you the report. What do you think about these findings? Please share your comments in the box below.